So I needed a card for my BIL who is known as Grumpy and he does love a drop of beer, so this image called Dwarf 6 from Mo Manning was perfect. He was a bit of a devil to layer, so parts had to have part tucked under another layer but part still had to be on top but in the end he was worth it. Once the layered were dry I used a silver pen for the diamonds on his wrist bands. When that was dry with a cocktail stick and glossy accents I added a drop into each diamond to give them a realistic look. The papers are some very old ones, some people who have been scrapbooking many years will recognise Basic Grey I think they were called Vagabond. I brought the beer die from Ally Pally and used a white pen and a gold pen to make my label. I used the Simon Says Stamp Stitched Frames with the MFT Stitched Stars to decorate. 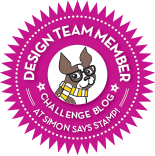 The sentiment is one that is left on my desk using the Simon Says Stamp Stitched Banners. Since its a mans card that was pretty much it. This is a great card !!! Great male card Debby! I'm sure your BIL will love it! 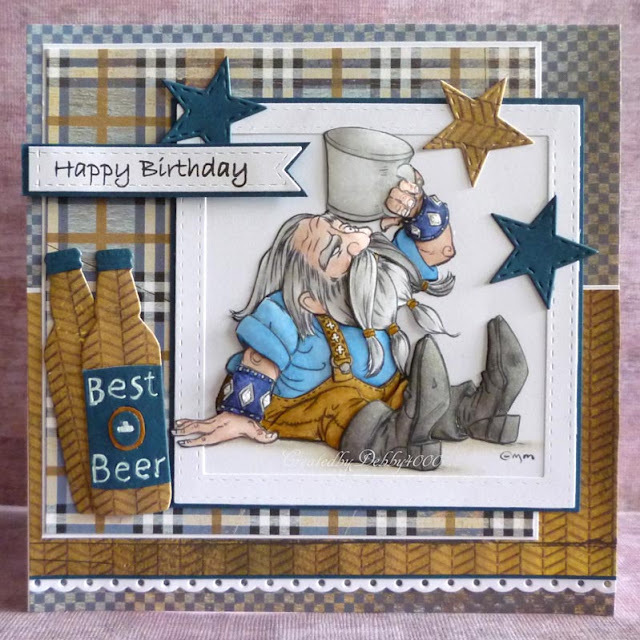 A brilliant card Debby, love the image- he looks fab and the beer bottles are the perfect finishing touch. Hahaha what a brilliant personalised card, bet 'Grumpy' loved this! Lamb, Beef, Pork or a pair of Geese!! !